It’s a relatively quiet trend, but the most active of investors—hedge funds and traders—are aggressively putting gold hedges in place. It shouldn’t really be a surprise, given the recent spike in volatility in the stock market. It hasn’t been reported much in the mainstream, but an increasing number of people who make their living from investing are betting on gold. We’ve shown this data before, but the trend continues to build strength. Gold trading volumes on the COMEX surged to yet another new high last quarter. Volume on world’s biggest futures market hit a record 23 million contracts in the first quarter. This swell in activity is quite remarkable. 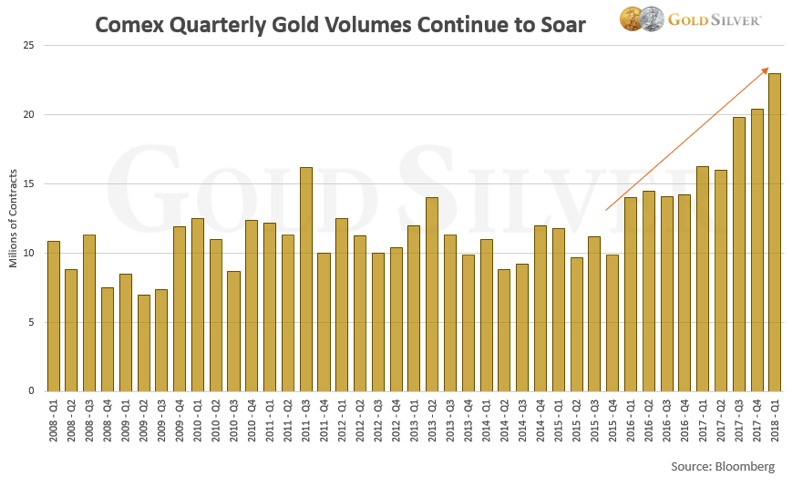 Volume is up a whopping 130% since gold bottomed in December 2015… it is more than triple the levels of 2006… it’s 40% higher than when gold hit its record price of $1,921 in 2011… and 65% higher than when traders dumped their holdings in 2013. To be clear, this data measures “trading” activity, so it includes both buys and sells. But the jump in volume over the past two years shows that that activity is bullish in nature, because prices are rising. Basically, investors have placed more buy orders than sell orders during this period, which pushes prices higher. If more sell orders were initiated, prices would be falling. Some of this activity is strictly trading—speculators that are betting the price is headed higher. But some of this is definitely hedging behavior. In other words, hedge funds and other institutional funds that have initiated a position in gold, via the futures market, to hedge their stock positions or other investments. Hedge funds and traders have never seen a greater need to own gold than right now. We can draw this conclusion because of the runaway increase in the number of contracts. The Comex hasn’t seen a 10% or 20% increase—the volume is more than double and triple what it’s been in the past, even during periods of big price movements. This ongoing barrage of activity signals an ever-growing interest on the part of traders and institutions in taking a position in gold. And it’s not just activity on the Comex. Holdings in GLD, the largest gold ETF, hit their highest level since October 2017. And speculative long positions by money managers hit their highest level in two years at the end of March. This has all served to push the gold price higher for three consecutive quarters, something that hasn’t happened since 2011. These are all clearly bullish indicators. You may be frustrated by the lackadaisical price movement in precious metals, but this data clearly shows that many professional investors in the mainstream community are building positions in gold right now because they either think the price is headed higher or they recognize gold’s value as a hedge against risk asset markets. Hang on, my friends. A shift is coming, and when it does, we will be handsomely rewarded. Make sure you own the amount of gold and silver you want to have in your possession and under your control when the next crisis inevitably hits.